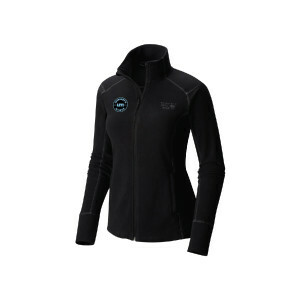 We’re pleased to debut our latest women’s fleece with premium outdoor retailer Mountain Hardwear. Featuring a sky-blue embroidered Umphrey’s McGee patch on the right chest area, this awesome microfleece will hold your warmth even when the weather is brisk. The lightweight yet toasty full zip-up features an adjustable waist hem and zippered security pockets to protect your goodies. Ideal for traveling to your next UM show, casual wear, or backpacking and hiking, the WickQ™ moisture-wicking microfleece keeps you cool and dry while looking fly. New for holiday 2018.